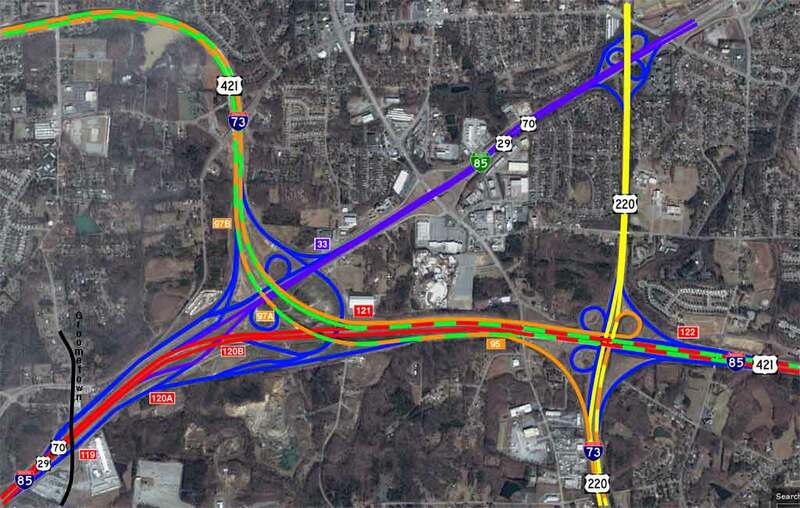 I 85 South/US 70/29 - Exit 97B to I 85 Business/US 70/29 South, which merges with I 85/US 70/29 South. I 85 North - Stay on US 421. I 85 Business/US 70/29 North - Exit 97A to I 85 Business/US 70/29. US 220 South - Stay on I 73. US 220 North - Follow directions to I 85 Business and continue to US 220 exits. I 73 South/US 220 South - Exit 119 to Groometown. Go straight through the light at Groometown. Bear right to I 40/I73. Exit to I 73/US 440. US 220 North - Exit 120A to I 85 Business/US 70/29 and continue to US 220 exits. I 73/US 220 South - Exit to US 220 South. Stay on US 220 South. I 85/US 70/29 South - Take the Groometown exit. Go straight through the light at Groometown. Enter I 85/US 70/29 South. I 85 Business/US 70/29 - Stay on US 220 North to I 85 Business/US 70/29. US 220 North - Stay on US 220 North. From US 220 North - Follow I 73 directions. I 73 North/US 421 North - Exit to I 73/Groometown collector lane. I 73 South - Stay on US 220. I 85/US 70/29 South - Exit to I 85 Business/US 70/29 South and continue onto I 85/US 70/29. I 85 Business/US 70/29 - Exit onto I 85 Business/US 70/29.